At a Royal Society gala in London January 30, Leanpath received the 12th annual Rushlight Environmental Management Award, one of the evening’s overall prizes for the most significant innovation in sustainable technology among 28 category winners. 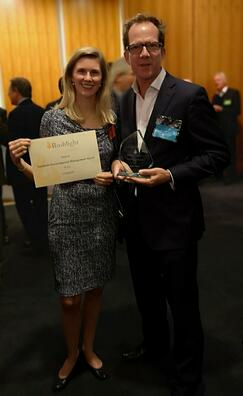 Leanpath also won in the category of Sustainability Initiative for work in expanding food waste prevention globally. Award categories ranged from clean energy to resource innovation. Awards are given in each category, and one of the category winners is chosen most innovative and awarded the Rushlight Environmental Management Award. Celebrating its 15th year preventing global food waste, Leanpath, and the thousands of kitchens it works with, currently prevents 1 pound of food waste every 3 seconds, 1 kilo every 7 seconds.